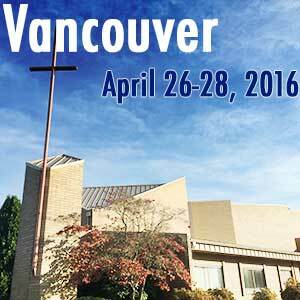 Reports on the ground indicate that hundreds of Church of God people are making their way to Vancouver Church in Vancouver, Washington, for the first of three Regional Conventions scheduled for 2016. Anticipation is higher than ever for the speakers who will address the convention theme—Reclaim Your Neighbor[hood]—including Milton Grannum, Ben Hardman, Arnetta McNeese Bailey, Steve Arterburn, and Reggie McNeal. Many will also stick around for the CHOG Table on Thursday, as the discussion turns to the timely topic of sexual ethics. The first session of the Regional Convention begins tonight at 7:00 PM PDT with Milton Grannum speaking and Alanna Story leading worship. Last year’s historic General Assembly decision to hold the annual convention every other year also prescribed smaller-scale, regional gatherings to be held in the years between. 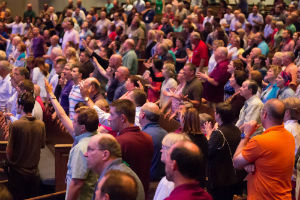 At the direction of the GA, Church of God Ministries planned and developed Regional Conventions with the same program to be held in three different locations with a wide geographical spread—the first in Vancouver, Washington (April 26–28), the second in Anderson, Indiana (June 21–23), and the third in Philadelphia, Pennsylvania (September 27–29). While the topics at the CHOG Table will differ from location to location, related materials are expected to be produced based on the dialogue of each event to inform and resource the movement. Photo: Convention 2015 crowd in Oklahoma City. The Regional Convention program book is now available online for you to browse and see for yourself what hundreds of your brothers and sisters in Christ are experiencing in Vancouver this week. Be sure to use #Reclaim2016 to join the conversation on Facebook, Twitter, and Instagram. Learn more about this year’s Regional Conventions and how you can register for the Anderson and Philadelphia events at www.chogconvention.org. This entry was posted in All Church of God, Church of God Convention, Western and tagged camp meeting, CHOG Convention, CHOG Table, Chris Kainu, Church of God Convention, Jim Lyon, NAC, Oregon, Pacific Northwest, regional conventions, regional gatherings, Vancouver, Vancouver Church, Washington, West Coast. Bookmark the permalink.